Announcement I love using sterling silver, Swarovski crystal, and natural gemstones in my beaded jewelry designs. Sterling silver and crystals add the sparkle, and natural gemstones add the splendor. I have also incorporated stainless steel and other metals into some of my jewelry designs. Please take the time to browse my shop and find a special piece of jewelry for yourself or as a gift. If you like what you see, "like" me on Facebook too! If you wish to be added to my email list for information on new special items and sales, select the "Contact" button on the left and send me your email address. I love using sterling silver, Swarovski crystal, and natural gemstones in my beaded jewelry designs. Sterling silver and crystals add the sparkle, and natural gemstones add the splendor. I have also incorporated stainless steel and other metals into some of my jewelry designs. This was a gift for my mom and she loved it. Beautiful crystals and perfect size! Customer service was fabulous !!! I am extremely happy with this bracelet. The design is really very pretty and it hangs just perfectly on my wrist. I really like the shape of the stones. They lay nicely on the wrist. Can't say enough about this lovely piece...thank you! 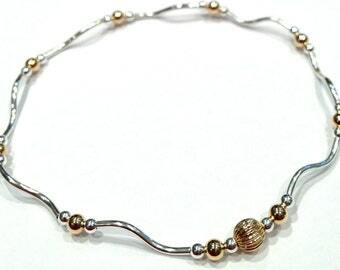 I will always love the sparkle of sterling silver beads. These are just so pretty. I had so many tanzanite and sapphire Swarovski crystals that I had to make something! I love this design. So beautiful. Anklets are now in season here in the Northeast! Love making them using stretch cord. So comfortable! The more sparkle, the more beauty. I am a database architect by day and jewelry designer by night. I love being creative and display my creativity in my jewelry designs. Welcome to Sparkle & Splendor! 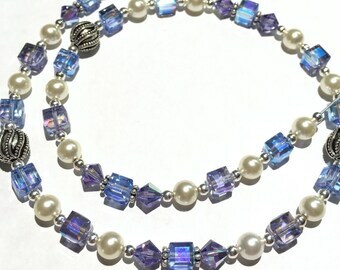 All items are made with quality products, including Swarovski crystal, gemstones, and sterling silver. Special care is used in creating each item, and therefore you will be able to enjoy your sparkly jewelry every time you wear it. I want you to be completely satisfied with your purchase. If you do wish to return your item, please contact me within 3 days of receipt of the item. Returns must be in new condition. The buyer will be responsible for return shipping charges. Please convo me and I will email you return instructions. Returns made within 7 business days of receipt will be fully refunded, excluding original shipping charges. Returns made after 7 business days of receipt will be accepted for exchange only. Returns made after 30 days will not be accepted. My jewelry is made with care and should not break during normal wear. If an item does break by accident, I will be happy to repair it once, for no fee. All pieces must be returned for the repair. Only the return shipping charge is the responsibility of the buyer. I am now accepting PayPal, major credit cards, and Apple Pay. Payment is due at time of checkout. ** NY Residents ** A request please: Because NY tax laws require sales tax to be based on where the items are being shipped to, if the buyer would contact me with their zip code prior to their order, I can properly assign the correct sales tax. Once I have defined the zip code and tax rate, the order can then be placed and sales tax calculated correctly. Thank you! A 8.375% NY sales tax will be added to purchases shipped in NY if a zip code is not provided to me prior to the sale. If payment is not received within 2 business days, the sale will be cancelled and the item will become available on the site again. Orders will ship within 3-5 business days, pending receipt of payment. US orders will be shipped USPS First Class, or USPS Priority if requested. Additional charges may be applied for Express delivery. Shipping costs include delivery confirmation. I will not be responsible for lost orders since there is tracking on the item. * International Orders - Please convo me if you would like an item shipped to a location outside of the US. There are so many price variables that should be discussed before I will ship the item. Shipping is free in the US for any item ordered over $100.00. All items will be packed in a nice silver box that can be gift wrapped. I take pride in my designs. I welcome your feedback and comments. If for any reason you are not happy with a purchase, please contact me first before leaving negative comments on this site. I would like to make sure your concerns are addressed and I continue to have satisified customers.